Radiant heating is an ancient method of heating through the use of radiant energy, such as the warmth you feel from the sun. The systems depend largely on radiant heat transfer; the delivery of heat directly from a warm surface to the people and objects around it. Radiant heating is the effect you feel when you can feel the warmth of a hot stove top from across the room. 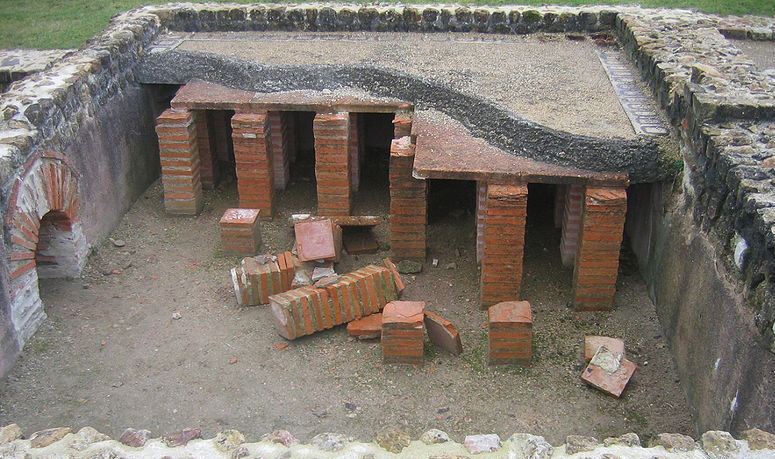 The use of radiant heating can be traced back to the Romans who used a hypocaust, which was a system that heated homes with hot air under the floors (pictured above). Underfloor radiant heating also has a long history throughout Asia. Infloor Heating Systems is proud to offer radiant heating solutions designed to improve your everyday living and comfort. There are many benefits to Infloor radiant heating. It is energy-efficient, reducing gas and electric bills, eliminates duct work and duct heat losses, creates a quieter home, and is a healthier way of living for those with allergies. It is a superior heating method that easily adapts to ‘green living’ with solar and geo thermal options available for increased savings. Whether you’re building a new home or business, or remodeling your present one, isn’t comfort one of the most important qualities you desire? Radiant heating has always been the most comfortable, energy-efficient choice for heating any area. Let’s look at some of the ways Infloor radiant heating can improve your life. Infloor radiant heating provides you with a level of comfort that no other heating method can match. It warms you from the floor up by warming all the surfaces within a room, including walls, furniture, and of course, people and pets. Constant, even heat is concentrated at the floor level, where you live. Our customers tell us “There’s nothing like waking up and stepping onto warm floor.” That’s because, like the sun on your face, or the warm sand under your feet, living with radiant heat is one of life’s simple pleasures. By turning the ﬂoor of your home into a source of heat, you, your family and guests will feel its warmth and comfort directly. Studies have shown radiant heating provides greater emotional and physical comfort and directly affects and improves emotional well-being, while influencing positive behavior. Just like the comfort you feel when holding a warm cup of coffee or tea. Why live in a dust bowl? Forced air systems, even with the best ﬁltration, still blow dust, allergens, and dirt throughout your home. 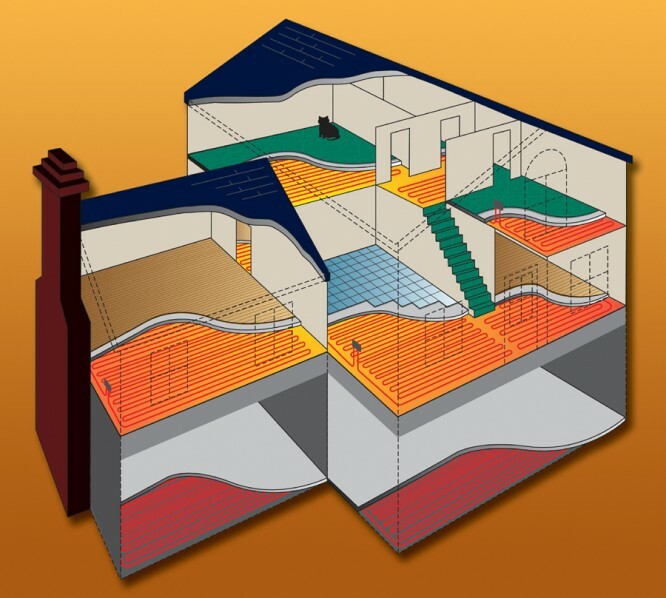 An Infloor radiant heating system provides you with nothing but even warmth and comfort. Radiant heating eliminates airborne dust and allergens, improving the air quality throughout your home, office, or building, making it a cleaner, healthier environment that everyone will breathe easier in. The energy-savings can be impressive. According to the Radiant Panel Association, most homeowners can accrue energy savings of 10% to 30%. For commercial installations, savings of up to 60% or greater are possible. Studies conducted by the American Society of Heating, Refrigeration and Air Conditioning Engineers (ASHRAE) indicate that with radiant heating systems people can be comfortable at temperatures 6 to 8 degrees (Fahrenheit) lower than with conventional systems, such as forced-air and baseboard heat. While forced-air may be somewhat cheaper to install, radiant systems are more economical month after month. Infloor’s signature products provide constant, even heat that keeps the temperature throughout any room nearly the same, reducing heat loss up to 25%. Optimize energy-efficiency and comfort with zoning. Easily control indoor temperatures for each room or zone within a building. Infloor radiant systems allow you to have several heating zones in your home or business that each have their own temperature. Unlike traditional forced-air systems that typically have one thermostat for an entire building, Infloor radiant heating can be zoned to fit your needs. For example, we often use a daytime/nighttime zoning scheme, which allow the daytime areas to be kept a little warmer than the sleeping areas. This also gives you the option to keep your regular living areas warm and comfortable while reducing the temperature in guest rooms or basements that are infrequently used.